Superpay.me is a paid survey and get-paid-to (GPT) site that offers several ways to earn money, and the name makes it sound like you can earn a lot of money. But is Superpay.me a scam or a super way to make money online? I have been a member of the site for quite a while and have tested the site thoroughly, and in this Superpay.me review, ýou will find the answers to the above questions and many more. You will see what the site has to offer, what you can expect, if you join, you can find a guided video tour, and find tips and advise about how to get the most out of the platform if you decide to join. What is Superpay.me and what opportunities does the site offer? Superpay.me has existed since 2012, so it has been around for a while. I have myself been a member for quite a while. Let me just reveal right away that it is a legit site – I know this from personal experience as I have been paid by it many times myself. It offers many ways to earn, so it has a pretty big earning potential. This does, however, not mean it will necessarily be the right site for you. So let’s go over what ways you can earn on Superpay.me, so you can see if it is relevant for you or not. Superpay.me has many daily opportunities for taking paid online surveys. It is one of the survey sites that collect surveys from a lot of different sources into their page. That makes it an easy way to get access to many different surveys in one place. You can find many paid surveys on Superpay.me. The only thing you have to be aware is that because Superpay.me has so many different ways to earn and offers many different surveys, it can at first be a bit tricky to find your way around the site. It does however not take too long to find out how to navigate and use the site, and I have also made a small video guide, you can find later in this review, that can help you to get started easily and see exactly how it works. It can sometimes take a bit of patience to find the surveys you qualify for on Superpay.me. This does, however, depend a lot on the country you live in. And after a while, you will be able to figure out what kind of surveys you most often qualify for, and then just focus on these. But overall, you can really find a lot of online surveys on Superpay.me and it is definitely one of the earning methods you should use if you join it. 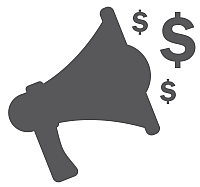 In addition to paid surveys, you can also earn by taking what is called paid offers on Superpay.me. It can, for example, be to sign up for a certain website, watch videos, click ads, download an app etc. Some of these offers can have really high rewards, and Superpay.me has a good amount of them as it gives access to many offer walls compared to similar sites, and it regularly ads new offer walls. Some of the many offer walls you can get access to on Superpay.me. On some of the offer walls, you can also at times find extra paid surveys if you do not have enough in the paid surveys section. With the paid offers, just always make sure to check the conditions before you take any of the offers, so you know what you need to do to get the rewards. 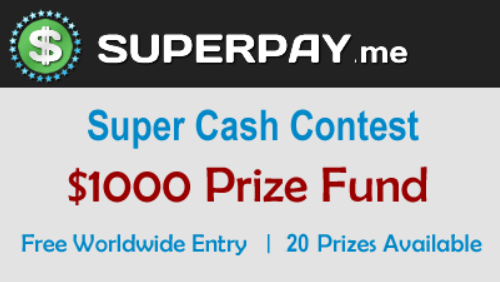 Superpay.me has a quaterly cash contest where there are prizes for $1000. Superpay.me has a free contest, where you can win big cash prizes. To participate in this contest, you have to do surveys or offers. The 20 people that earn the most within the period, will get a prize. The first prize is $350, second prize $250, third prize $100 and it continues like this to number 20 on the list that will get $10. A nice extra reward to get if you manage to finish in the top 20. You do not have to do anything else than be active on the platform to participate in this contest. When you are active, you will automatically participate, and it is free to be a part of. Compared to similar contests on other sites this is really high prizes which I think is a very nice extra way to reward its active members. You can earn $1 by posting a payment proof to an internet forum of your own choice. So once you have been paid by Superpay.me, you can share your email receipt for your payment on an internet forum to earn $1. You can only do this once and make sure to also check out the rules on the forum you are posting on, as you might end up getting banned there if they see it as spam. In the “earn money” section of Superpay.me, you can find a couple of subsections with videos. This means you can get paid to watch all kind of videos in more or less any category. There are videos in more or less all categories. The videos can be entertaining, but on GPT sites in general (including on Superpay.me) the videos do not have very high rewards. So, in my opinion, you should not watch them only to earn as Superpay.me then have better ways. But as entertainment, it can be fun and then it is great to earn a bit at the same time. Superpay.me has a section where you can get cashback into your Superpay.me account, when you shop at stores like Macy’s, Walmart, and more. New stores are continuously added. Currently, this particular way of earning is only available in the US, but it might be introduced to more countries later. So if you live in the US and like shopping online, this can be a great way to get some good savings. You can also make extra money by inviting friends to join Superpay.me. You will get 25% of their earnings. That does not mean they will get 25% less. They will get the same rewards, as if they had joined without you referring them. The 25% are paid by Superpay.me to thank you for referring someone else to their site. An extra bonus Superpay.me sometimes offers is promo codes. They will publish these codes on their Facebook and Twitter page. If you are a member, you can then take this code and put it into a field on the website, and you will get a free cash bonus on your account. It is usually around $0.20 so it is not a huge bonus, but it also only takes around 10 seconds to do, so still a nice extra thing to take use of, if you are a member of the site. The site is free to sign up for and free to use, and you will get a 0.20 dollar bonus for signing up. Below I have made a small video tutorial of Superpay.me, so you can get a sense of what it looks like as a member and see how to use it and how to find your way around. Whenever you take a survey, an offer or anything else on Superpay.me, you mostly earn dollars, so it easy to see exactly what you earn compared to sites that use points as rewards. Some surveys or offers do, however, pay in points, but these can easily be exchanged into cash. 1 point is worth 1 cent, so it is easy to calculate. You can then choose to get paid out in several ways. You can get paid through PayPal, Payza, Skrill, Bitcoin, or Amazon gift cards. Superpay.me offers great payout methods. Personally, I prefer survey sites that has PayPal has a payout option, so I am very happy this is one of the options on Superpay.me. You will be able to get a payout already when you have made $1. This is one of the lowest payment thresholds out of all the survey sites I have used and tested, and it means you can get paid very quickly. For payout in Bitcoins, the threshold is however $50. Be aware that Superpay.me will charge 2% in administration fee to pay out to PayPal and Skrill, and 3% to Payzaa. When you request a payout, you will have the money on your account within 24 hours. But in my experience, you will in most cases already have the money after a few hours, which is very fast for a survey site. Before you can get a payout, Superpay.me might ask you to verify your address or phone number. This is to minimize fraud on their site. If it is necessary depends where you live, and you will be told, if you need to do it. This is only necessary the first time you get paid. Personally, I had to confirm by getting an automated phone call from them. It was very easy, was free, and took less than 1 minute. So this is nothing to worry about if they ask you to do this. How much time do you have to spend to make money on Superpay.me? Superpay.me has many opportunities, and you can therefore spend a lot of time on the site. But you can also choose to spend only 10 minutes a week or less, if that is what you want. But, of course, the time you put in will also reflect your earnings. The size of the rewards in relation to the time spent varies a lot depending on the survey and offer. But they are in general ok compared to other survey sites. The rewards will usually be between $0.50-$2 per survey, but they can also be bigger. You can always see the size of the reward and a time estimate before you start a survey, so you can just choose to do the ones that you find reasonable. Because Superpay.me has many ways to earn, it has a good earning potential. But compared to other survey sites, it can be confusing to navigate it in the beginning, so just take a bit of time at first to get to know the possibilities it has. Also, you have to be prepared that you will not qualify for all the surveys that are available – especially until you figure out the best types of surveys for you. That is, however, the case on more or less all sites that offer paid surveys. So, in the beginning, it takes a bit of patience, but it the also has potential in the long run. Like with any other survey site, I just want to make you aware that you should not expect Superpay.me to make you rich. If you spend some time there, and especially if you manage to get in the top 20 and get an extra cash reward, you can make some really nice extra money there. But do not aim for it to make you rich or to be a full-time income. How good the support on a survey site is says a lot about it. I have several times had the need to contact Superpay.me’s support with questions, and I must say they are very responsive. I once had my account banned, because I tried to login after moving to another country, and when I explained the situation, they solved it very quickly. In general, I have always received a very quick and helpful reply from their support and this is, in my opinion, something certain other GPT and survey sites could learn a lot from. You can also contact the support on the official Superpay.me facebook page, and it looks like they are very responsive here as well. In which countries is Superpay.me available, and who can participate? Superpay.me is available worldwide, and you can sign up no matter where in the world you are from. The amount of offers or surveys you can participate in will, however, vary greatly depending on the country you live in. You will be able to take some surveys and offers from most parts of the world. But there will be most both surveys and offers available, if you live in an English-speaking country. Be aware that you are not allowed to login, if you are in another country than where you are registered as living, so you cannot do surveys on Superpay.me while travelling. The site is very strict about this, so if you login from a different country, you can have your account blocked right away without warning (I know from experience). You have to be 18 years old to sign up. No doubt Superpay.me is legit and not a scam – I know as I have been paid many times by it myself. This does, however, not mean it will be the right option for you, but I hope this review has helped you figure that out. You can get paid very fast through PayPal, Skrill, etc. As you can see, Superpay.me has both positive and negative sides. But overall, it is a site with very good opportunities if you just are a bit patient in the beginning and take the time to get to know how to use it. Especially, if you live in English-speaking countries it gives good opportunities, but you can also find good ways to earn from many other countries. And the low payout threshold, the fast payout process, and the very responsive support are something I personally really appreciate and are reasons it is a site I still actively use very often. It is easy, fast and free to sign up for Superpay.me. Just click the button below, and it will take you to Superpay.me, where you can sign up. It only takes a few minutes, and you will get $0.20 as a joining bonus, so you will already be close to your first payout. After you join, you will be able to start earning right away. I hope that you now know Superpay.me is a legit survey site. If it is worth joining depends a lot on your preferences and the country you live in, but I hope this review has helped you make that decision. If you have any comments, any questions, or have any experiences with Superpay.me yourself you would like to share, I would love to hear from you in a comment below. Superpay.me has a lot of daily opportunities to make some extra cash. How many does, however, vary depending on the country you live in. At first, it can take a bit of time to learn to navigate on the site, but it has potential if you are a bit patient. It has great payout methods, fast payout processing, and super fast support, so it is definitely a legit site. I learned a lot from your post and i want to thanked you for it. I wanna ask you a personal question. From your own opinion,which survey site is most effective with low minimum payout?? Will you please suggest me personally which survey site could perfect for me?? From which site i could make 15$-20$ in a week by working 2/3 hour everyday. Please suggest me from your previous tested sites.I don’t want to spend my time in any fake site.Because there is so many negative review about many site that they don’t pay or don’t give point after completing tasks. Thanks in advance and wish that you will answer me soon. I have made a list of the quickest paying surveys sites, where you can find a list of legit survey sites with low minimum payout. From the criteria you mention, I would suggest to join several sites to get more opportunities. From what you seem to be looking for, I would especially recommend the following sites form the list you can find through the link above: PrizeRebel, ClixSense, Superpay.me, GrabPoints, and SurveyRewardz. They all pay out quickly, and I have been paid by them several times myself, so I know they pay. I have also received your email – I will reply to that email to the additional questions in just a few minutes. Thanks a lot for your suggestion. Firstly I thought may be you will not reply me. Thats why i mailed you also. But really you are a good person and thanks again. You are welcome Orith – glad I could help. I would suggest to submit a ticket to the Superpay.me support at the website. They are usually very fast at getting back to you, and I am sure they can help you. Let me know how it goes and if you have any other questions. Hi! Im signing up with paypal but im having difficulty with the Receive Payments with PayPal option can i opt for buy with paypal instead? 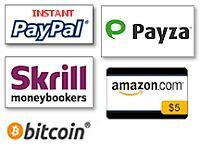 If you cannot or do not want to use PayPal, Superpay.me also offers to pay out through Skrill, Bitcoin, or gift cards to Amazon, so you can use one of these options instead. Why not? Are the other two options covertible to cash? Not sure I quite understand your questions. If you live in a country where PayPal is available you can get paid through PayPal. If you want to use another method instead, Superpay.me also offers Bitcoin or Skrill. Skrill works a lot like PayPal, and you can get your money out in cash. Bitcoin is a cryptocurrency. Check my reply to your previous message below. It should give the answer. If not then let me know. If you have chosen a wrong country, just contact Superpay.me’s support and explain the situation. They are usually very fast at getting back to you. they ones helped me with a similar scenario where I was flagged because I logged in from another country while I was on holiday. So I am sure they can help you. Feel free to let me know how it goes. I use a different paypal email from the one I use for surveys….Will this be a problem on this site? On Superpay.me this should not be a problem. When you cash out, you choose which PayPal you want to cash out to, and you can choose a different from the one you have signed up with. 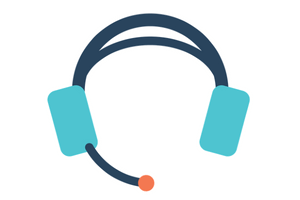 On many other sites it might be an issue, as they often just automatically pay out to the email you registered with, so then you would need to contact support to ask them to fix it. But as I said, for Superpay.me you will be fine. You are welcome Adaeze. Great to hear you like it. but i didn’t received money in paypal…. I have never had problems receiving payments from Superpay.me. How long ago did you request the payment? Usually the transfer will happen within a few hours, but if it is your first time to withdraw, it might take a couple of days at the most. If you have still not received the money in 2 days, you should definitely write the support to see what is going on. The support is usually very fast at getting back to you. And feel free to let me know how it goes. Mikael,take greetings brother.I wanted you to evaluate on one point. How exactly does the verification process work? Do they call you up or something?When do they ask you to verify? There are two different ways SuperpayMe uses to verify your account. There is the telephone verification that all members have to do the first time they request a payout. It is an automated telephone verification process that does not take long and that you only have to do once. SuperpayMe also sometimes ask for address verification. It can be done as a random check or if there is a suspicion of cheat on a certain account. You will then be asked to upload a document that proofs your address. I my case, I have been asked to do this as I recently moved to a new country. I then logged in to my account to update my info, but as I tried to log in from a different country than where I was registered on my account, there was an automatic block of my account. I then wrote the support and explained the situation and then I just had to proof my new address and then everything was fine again. Hope this gives you a better idea about how the verification process is. Just let me know if you have more questions. Hey man thanks a ton. Can you just elaborate on the phone verification thing. Do they call you up or something? You are welcome Nas. Yes it will be an automated call you will receive. Once you request your first payout, you will be told what to do. Hey man thanks a ton.Sorry for bugging you with all these questions.But let me explain my situation.I live in an Asian country.I am using VPS not VPN to do surveys.So all the other stuff is okay.But the phone verification thing.How do I overcome that?I have relatives who live in Florida who can help with this phone verification thing.But what kind of call are they expecting?Does a person call you or is it an automated call? Just feel free to ask Nas. I am happy if I can help. It is an automated call you will get. Not sure if you can overcome it by giving a number to a family member in the US. Have never tried. But often the survey sites are trying to avoid things like this so not sure if they have an extra security measure built in. But the good thing about SuperpayMe is that you can request a payout as soon as you have just made one dollar. So you do not have to spend much time before you can try to get a payout. Other than that, there are plenty of other sites that do not have phone verifications, and that gives very good opportunities as well. I visited Superpay Me, and tried out a few surveys. What I don’t like from it, is in many surveys they ask for too much personal information. But generally it works. I also made a small research about it online here and there, and generally it looks good, Superpay Me is exactly what you are writing about it. In fact, I will use their affiliate link and banners they provide, and promote it. In my opinion, Superpay me is a great site for those who would like to make some extra cash just by spending a few minutes of their free time to do surveys. Thanks for your comment Alex. Great to hear about your experiences with the site as well. Appreciate it. I don’t like the fact that you have to put in your personal info in more than once to do a survey. It just waste your time. I think I will pass on this! Superpay.me is in general not the most effective site for me, but how many surveys you will actually be able to take depends on where you live, so it might still be good to people from some countries. About surveys that you do not qualify for anyway will happen on almost any platform. Before doing any survey, you first have to fill out a couple of questions in a screening process. This is because certain topics are only for people with certain backgrounds, experiences, etc. So I do not think that is so much a problem, as that makes sense that I for example am not able to answer a survey about beers as I do not drink beer. However, at some sites you can end up qualifying very rarely which is of course annoying. Where I live (Scandinavia), Superpay.me does not have a lot, and therefore I prefer other platforms. But it might be good for people with a different background and living in another country.